Many residential homes are built on concrete slab foundations, and the plumbing for those homes often resides under the concrete slab. As long as the pipes function well and do not have any leaks, this plumbing installation method works great. Unfortunately, once those pipes start leaking, it often involves digging through the floor of the home and the concrete slab in order to remove the damaged pipe section and replace it. This can be extremely costly for the homeowner. If you know the causes and signs of a pipe leak, you can contact a pipe lining professional to make the repairs before major damage occurs. 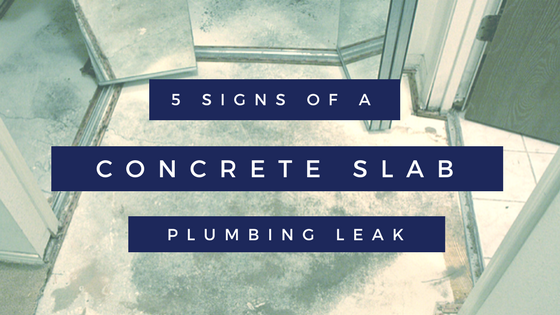 If you notice any of these signs of a plumbing concrete slab leak, you should call a professional plumber or pipe lining technician immediately. Slab leaks can lead to the degradation of your foundation as well as severe mold and mildew issues. You Hear Running Water – If you are not running a faucet or water using appliance and you hear running water under your floors, you may have a slab leak. You Have an Excessively High Water Bill – If your water bill is much higher than in previous months, you may have a slab leak. Your Flooring Is Wet – When a pipe leaks under a slab, it creates a puddle of water. That water is then soaked up by your concrete slab, and eventually, it will result in your floor or carpet being wet. You Have a Sudden Increase in Mold – Once the water is soaked up by your foundation, it will penetrate your walls. This will lead to the development of mold inside your walls and potentially on the surface. Knowing the causes of an under slab plumbing pipe leak can help you identify leaks before they do significant damage to your home and your wallet. Aging Pipes – If your pipes are near or at the end of their useful lives, you may start to experience small pinhole leaks. Corrosion – Acidic water can cause the premature corrosion of metal plumbing pipes, including copper. Excessively High Water Pressure – If you have abnormally high water pressure above 80psi, it can cause damage to your plumbing pipes, resulting in under slab leaks. Rubbing Against the Slab – If your pipes are against the underside of your foundation slab, they can rub against the concrete. Over time, this rubbing wears down the pipe wall, resulting in cracks and leaks. Shifting Soil – As your home settles and the earth beneath the home shifts, it can put pressure on your slab foundation and the pipes running under and through the slab, resulting in pipe cracks and breaks. Pipe lining can be successfully used to repair pipe under a slab foundation. The pipe lining process does not involve digging or cutting through concrete in order to make the repair. Instead, access points are located above the slab. Special pipe lining equipment is then connected to the pipe and the epoxy lining material is blown through the pipe, if it is a narrow potable water pipe or an epoxy pipe liner is threaded through the access points to the repair area and inflated. 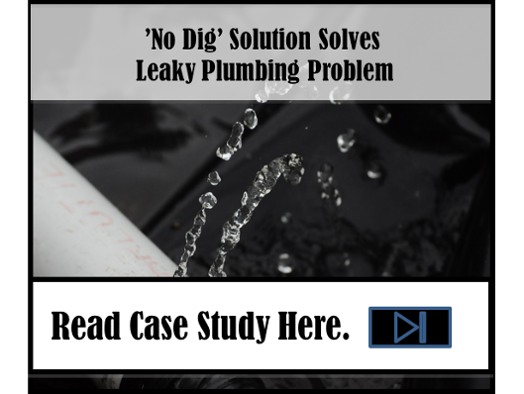 Nu Flow Midwest recently helped a local Riverwoods, Illinois couple repair their under slab plumbing leak so that they wouldn’t have to worry about any more pinhole leaks or costly, time-consuming traditional pipe repairs.